This article describes the basics of Competing Values Framework, developed by Robert Quinn and Kim Cameron in a practical way. After reading you will understand the basics of this powerful leadership and culture change tool. Besides the issue of how an organisation is structured in terms of hierarchical layers, department classification and management teams, in the 1980s, more and more research started to focus on the interpersonal relationships between employees in bureaucratic organisations. Organisational culture is born. Organisational culture is considered an important factor in influencing employee performance. An organisational culture is very abstract and is more about feeling than tangible evidence. Researchers Robert Quinn and Kim Cameron came to the conclusion that one must examine two factors when describing an organisation’s cultural typology; the degree of flexibility versus controlling behaviour and internal focus versus external orientation. 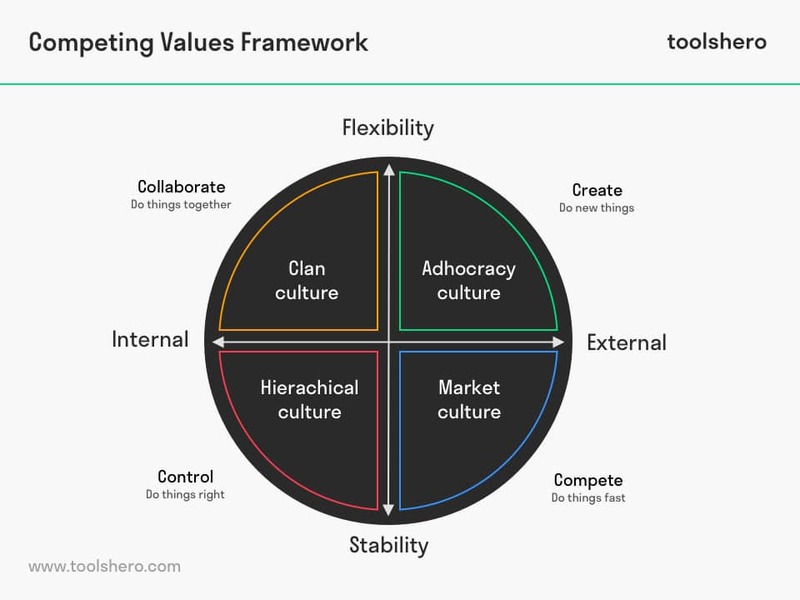 The Competing Values Framework, developed by Robert Quinn and Kim Cameron gives a classification of four corporate cultures, which indicate how a company operates, how employees collaborate and what the corporate values are. Via the Organizational Culture Assessment Instrument (OCAI), a method to assess organizational culture, the Competing Values Framework is filled with assessment results of the now and future state. Clan culture: high degree of flexibility and internally focused. In these organisations, the relationship between people is central. There is a friendly working environment, in which employees have a lot in common. Think of start-ups, family businesses or small ICT companies. These organisations resemble a large family. The leaders of these organisations are considered to be mentors or even father figures, who employees can approach very easily. These organisations are held together by loyalty and tradition. Mutual commitment is large and operations focus on human resources. Relationships, loyalty and morality are very strong and success is partly defined on the basis of customer satisfaction. The organisation places great value on teamwork, participation, flexibility and consensus. Hierarchical culture: high degree of controlling behaviour and internally focused. Hierarchical cultures are extremely formal and have a structured working environment. Government agencies are perfectly suited for this culture. Procedures determine employee actions and the focus is on managing control systems. As a result, there are clearly structured hierarchical layers present in the organisation. All work processes are efficiently organised, so that everything is under control and can easily be adjusted. It is important that the organisation runs smoothly. Formal rules and policies stabilise the organisation. Stability and results are associated with efficient and smooth execution of tasks. Success is generated from reliable supply, tight scheduling and low costs. Market culture: high degree of controlling behaviour and externally focused. In these type of organisations it is all about results and the completion of the work. Employees are competitive persons and extremely goal-oriented. Examples of such organisations are trade associations, insurance companies and banks. Managers are often demanding and closely follow employee activities. Simultaneously, there is lots of mutual competition. Within these organisations, the emphases is on reputation, success and winning. They will always strive to achieve measurable goals and objectives. Success is translated into market share and penetration. To the outside world, these organisations want to profile themselves through competitive pricing and market leadership. To stay ahead of the competition, there is ruthless competition to maintain customer retention. Customer service and satisfaction are terms that all employees are aware of. Adhocracy culture: high degree of flexibility and externally focused. In these organisations innovation is key; constant innovation with the aim to remain visible in the market. Research organisations such as the Dutch TNO or marketing and advertising agencies usually have such a culture. There is a dynamic, enterprising and creative work environment, in which employees are encouraged to strive for innovation and use their creativity to create new ideas. Besides innovators, the managers are also risk takers. Such organisations wish to be leaders and at the forefront of new products and/or services. For this reason, they encourage individual initiative and allow the freedom in determining what tasks to execute. The management of teams within a Clan culture aims to promote effective and smooth co-operation, all in order to achieve positive results. There is great attention to interpersonal relationships and therefore there is a lot of supportive feedback. Employees actively listen to each other and try to solve interpersonal problems. The personal development of employees is also key, so that through targeted training they can enhance their capabilities. Employment contracts are long-term and colleagues are extremely loyal and actively help each other to achieve better performances. The same applies to managers; they are very much interested in mentorship and trainee programmes. In this culture, the communal approach to work is central. The coordinating management team aims for execution of tasks according to strict guidelines. It is especially essential that all activities are aligned with each other. Managers mainly have a guiding and monitoring role and must ensure that progress is properly monitored. When work is not executed according to procedure, managers must hold employees accountable. Because this culture mainly focuses on its market position relative to competitors, it is important that employees are aware of the company’s position and are part of the company’s appearance to the outside world. Their appearance towards customers and suppliers is therefore very important. The managers’ job is primarily to inspire employees and make sure they maintain positive contacts with external relationships. As a result, there is constant attention for the relationship with the customer. Managers assess employees accordingly. Employees are therefore motivated and inspired to think and act pro actively in order to exceed customer expectations. This culture within the Competing Values Framework is all about forward-looking management. The vision for the future and the clear transfer thereof to employees is crucial, so that management can internally adapt at any level. Because an adhocracy is all about innovation, management aims to continuously improve its employees. As a result, there is a focus on improvement processes, flexibility and the challenging of employees to constantly aim for innovation. Managers are expected to adequately initiate and implement changes and approach the company’s immediate environment through networks and the creation of win-win situations and pass this back to their employees. What do you think? Is the Competing Values Framework applicable in today’s modern management environment? Do you recognize the practical explanation or do you have more additions? What are your success factors regarding the use of the Competing Values Framework? Cameron, K. S. & Quinn, R. E. (2005). Diagnosing and changing organizational culture: Based on the competing values framework. John Wiley & Sons. Goodman, E. A., Zammuto, R. F. & Gifford, B. D. (2001). The competing values framework: Understanding the impact of organizational culture on the quality of work life. Organization Development Journal, 19(3), 58. Hooijberg, R. & Petrock, F. (1993). On cultural change: Using the competing values framework to help leaders execute a transformational strategy. Human resource management, 32(1), 29-50. Patty Mulder is an Dutch expert on Management Skills, Time Management, Personal Effectiveness and Business Communication. She is also a Content writer, Business Coach and Company Trainer and lives in the Netherlands (Europe). Note: all her articles are written in Dutch and we translated her articles in English! We always have a combination of cultures, the question is what would be the optimized combination.